Death of Thomas Bull, Jr. Son of Thomas Bull Sr. and Susanna Harwell, Thomas Bull, Jr. was born about 1726, in Brunswick, Virginia. Brunswick Co. was created by Act of Assembly in 1720 from Prince George County (see Robinson, Virginia Counties, p. 76) with additions from Isle of Wight and Surry in 1732. The first court for Brunswick was held May 2, 1732, from which the records of this county date. The following poll list for 1748 gives the names of the residents of Brunswick voting for representatives in the House of Burgesses for the sessions of October, 1748, and April, 1749, and which resulted in the election of Sterling Clack and Drury Stith. John Wall Junr. Michael Wall Junr. Note: It is speculated that the Thomas Bull listed in this poll is Thomas Bull, Jr. because his suspected Father-In-Law, John Sulivant, is also identified in this poll. It is also speculated that Thomas Bull, Sr. is listed on page 63 of the same poll listing, residing in “William and Mary Quarterly”. Alternatively, their names could have appeared in reverse order. Having grown up in Brunswick, Virginia, Thomas Bull, Jr. moved with his parents to Halifax County, North Carolina (probably near Edenton, NC) some time between 1758-1761. Thomas Bull, Jr. (between age 33-35) married Sarah Randal. Almost nothing is known about Sarah Randal, but some believe that she was born in North Carolina during 1744 (which would have made her 18 years younger than Thomas Bull, Jr.). Some have speculated that she died in 1840 (which would have made her 96 years old at her death). But, this is all speculation (which is highly “suspect” because there were many women named Sarah Randal living during the same time and many in the same region). Sara(h) Randal(l) is an important figure in the Bull-Randall family genealogy. Whether she spelled “Sarah” with an “h” or “Randal” with one “L” or two is unimportant because at that time if a word sounded the same, then the spelling was considered “good enough” (as many people couldn't even write their name). Also, almost all of the Randal/Randol/Randle family lines living in northern North Carolina and southern Virginia at that time had ties to the Randolph family… and were referred to as Randolph or Randal during Colonial times (the names were often used interchangeably). So it is also possible that her name was actually Sarah Randolph. According to family legend, Sarah Randal was from Franklin County, GA. However, she was more likely Franklin County, North Carolina as that is a neighboring county to Halifax County, North Carolina. Knowing that one or more Randle/Randolph/Randall families were in Brunswick, Virginia (ref. : Deeds for RANDLE, RANDOLPH, RANDALL of Brunswick County, VA (1732 – 1800.) prior to Thomas Bull, Sr. moving his family to Halifax County, North Carolina, it is also possible that Sarah Randal met (and possibly married) Thomas Bull, Jr. prior to him moving to Halifax County, North Carolina. Since Thomas Bull, Jr. would later become involved with the Surveying trade (in Halifax County, North Carolina), it is possible Sarah Randal came from a family of surveyors; which influenced his decision to enter the Surveying trade. Further, by 1800 several other Randall families had settled in Franklin County, Georgia. It is possible that Sarah Randal's parents (and/or siblings) moved to Franklin County, Georgia along with her and Thomas Bull, Jr.
Halifax County Land Grant of 490 acres issued to Thomas Bull on Aug. 3, 1761. Halifax County Land Grant of 216 acres issued to Thomas Bull on Jan. 10, 1762. In 1766, Thomas Bull, Jr. (as Thomas Bull, Sr. is believed to have died in 1763) sold more land that was owned in VA. It's possible that this was land bequeathed from Thomas Bull, Sr.
22 September 1766 – THOMAS BULL OF THE COUNTY OF HALIFAX, IN THE PROVINCE OF NORTH CAROLINA sells to Swan Prichard of the County of Brunswick in the Province [sic] of Virginia – for £10 – 46 acres of land in the County of Brunswick, adjoining lands of Thomas Jackson, etc. Recorded 23 September 1766. Source Information: Hamlin, Charles Hughes. Virginia Ancestors and Adventurers. Baltimore, MD, USA: Genealogical Publishing Co., 2003. While Eggnog is most associated with Christmas today, it became popular in Britain during the early 1700s and, of course, made its way to the Colonies; where it underwent some minor modifications and became a popular winter beverage among the wealthy - of which Thomas Bull, Jr. would certainly have been considered. George Washington's Eggnog This is from his own recipe archives, although he forgot to mention how many eggs to use. MIX LIQUOR FIRST, then separate yolks and whites of eggs, add sugar to beaten yolks, mix well. Add liquor to mixture drop by drop at first, slowly beating. Add milk and cream, slowly beating. Beat whites of eggs until stiff and fold slowly into mixture. Let set in cool place for several days. Taste frequently. The “1784-87 North Carolina State Census” shows a Thomas Bull was “Head of Household” living in Halifax, NC (District 12) on February 12, 1786 (Thomas Bull, Jr. would have been 66 years old). 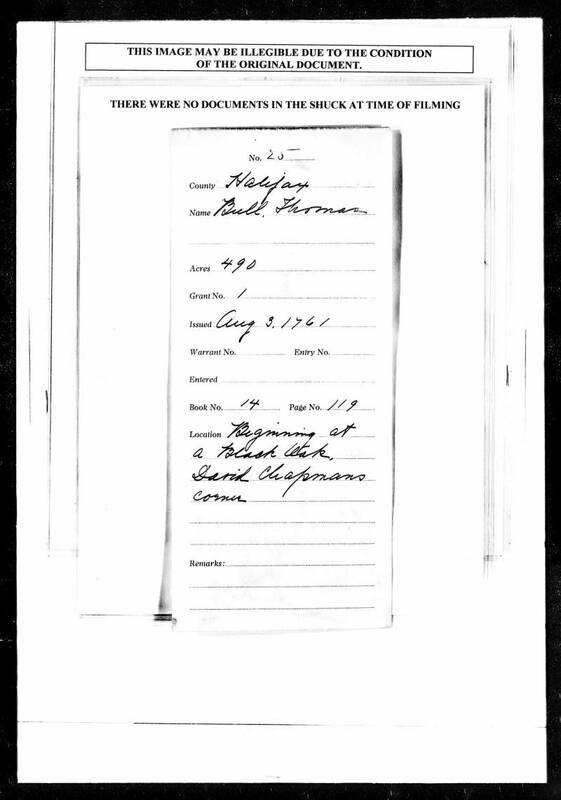 The census taker was… Thomas Harvey (probably Thomas Harvey, Jr. – whose sister, Hannah Harvey, would later marry Thomas Bull Jr's son, John Bull). Source: Register, Alvaretta K. State Census of North Carolina, 1784-1787. Baltimore, MD, USA: Genealogical Publishing Co., 2001. Both the “North Carolina, State Census, 1784-1787” and “1790 United States Federal Census” (the first U.S. federal census ever performed) reveal limited information because Thomas Bull, Jr's children were grown by this time. The numbers listed in the census may easily have been grandchildren. The census reference to “Halifax, Edgecombe” is because Halifax County was created from a portion of Edgecombe County on January 1, 1759. 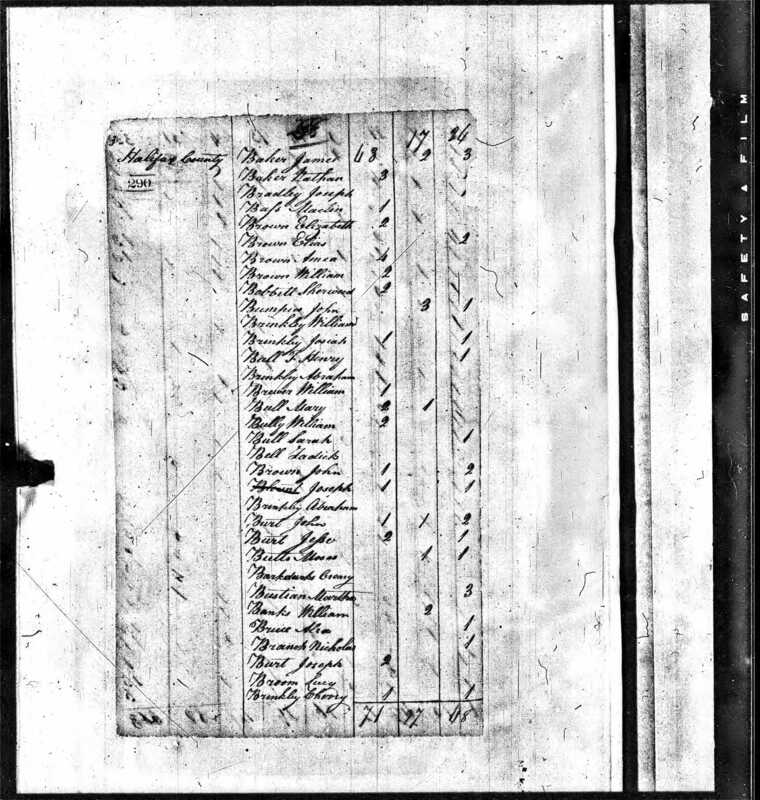 Source Citation: Year: 1790; Census Place: Edgecombe, Halifax, North Carolina; Series: M637; Roll: 7; Page: 457; Image: 267; Family History Library Film: 0568147. Because Sarah Bull is listed as the primary person (e.g., “Head of Household”) in the “1800 United States Federal Census” we can assume that Thomas Bull, Jr. died some time between 1794 and 1800 (at age 68-74); although we can speculate that it was 1794 based upon his Will being recorded that year. In 1800 Sarah Bull was approx. 56 years old. It is not known exactly when Sarah Bull died (obviously after 1800). 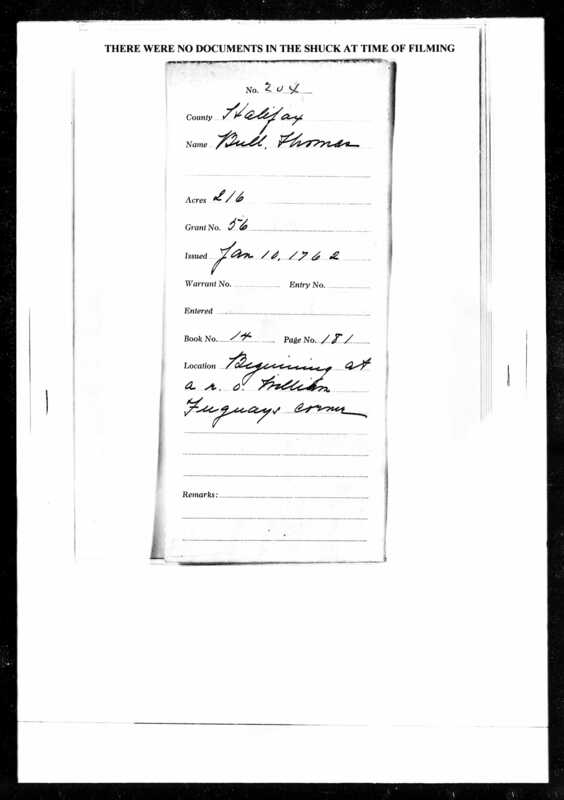 Source Citation: Year: 1800; Census Place: Hallifax, Halifax, North Carolina; Roll: 30; Page: 290; Image: 292; Family History Library Film: 337906. February Sessions, 1794. Then this Will was Exhibited in Open Court and Duly ______ by the Oath of Isham Davis. One of the Subscribing Witnesses thereto & on ___ Ordered to be recorded. Whereupon the Executors in the stated Will Nominated, Came in and was duly Qualified thereto. Typed abstracts of Wills appear in “Abstracts of North Carolina Wills & Testator Index”, Book #975.6, pp. 135: Thomas, Jr.: Halifax County, recorded 1794, Will Book 3/219, mentions wife Sarah. (Orig. in State Archives). 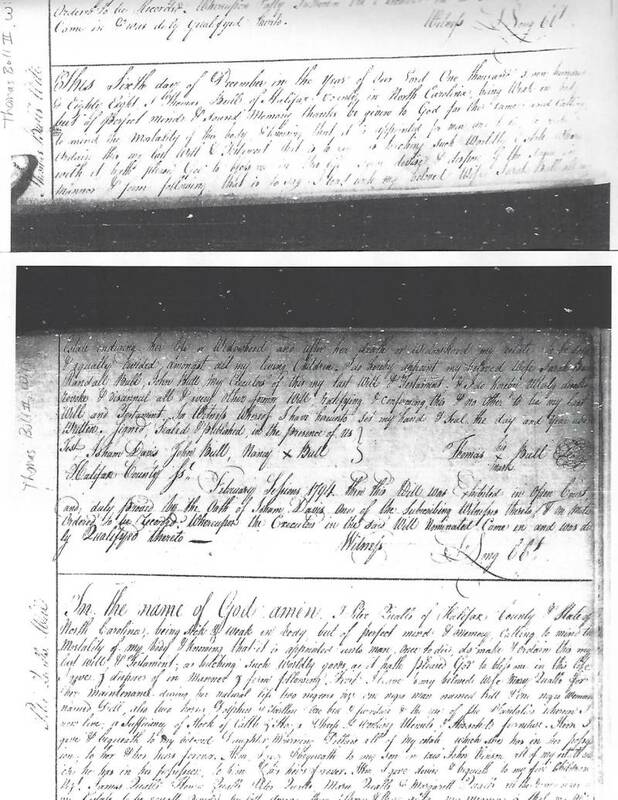 Source: “Genealogical Abstracts of Wills, 1758-1824, Halifax County,North Carolina”, Margaret M. Hofmann. Descendents of Thomas Bull, Jr.